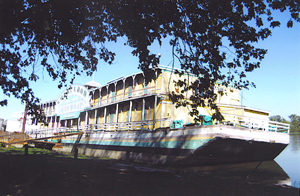 The Goldenrod Showboat has been a part of American history since she was built in 1909. She traveled the rivers of the Midwest, touching the hearts, minds and imaginations of generations with the broad spectrum of entertainment offered by those who lived aboard until she settled in St. Louis in 1937. There she would become a long time sensation, attracting performers and audiences alike from all over the globe. She remained a large part of the entertainment scene of the metropolitan area until her doors were closed in 2001 and she was moved to the Illinois River and docked in Kampsville. . . .
Another website with more photos of the Goldenrod, taken August 2015: ArbitraryPhotography.com. We feel the deepest regrets for the state of this once mighty showboat.